Are you tired of constant pain on your back, joints, knees, shoulders and neck? Are you looking for a simple wallet-friendly solution? The solution lies is far infrared heating pads. For years, my dad suffered unbearable pain on his back. The pain never went away even after using the standard heating pad. Don’t try to become ‘accustomed’ to any pain on your body. My dad tried and it didn’t work. What worked for him was the UTK Jade Stones far infrared heating pad. Backache and neck pain can mess you up and halt your life. There are several effective at home remedies for neck and back pain. One of the most versatile methods available is the use of infrared heating pads. 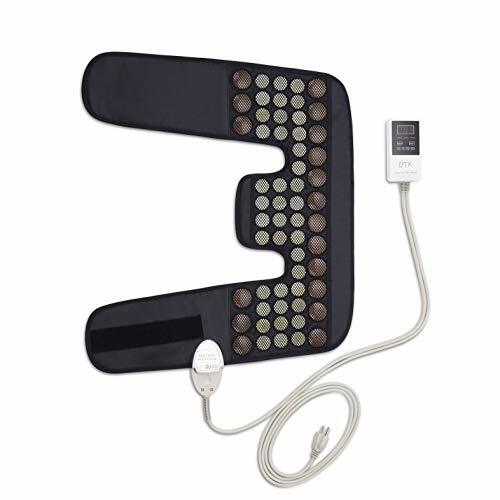 Far infrared heating pad with jade, tourmaline, obsidian or amethyst gemstones are effective, easy to use and durable. In this review, we cover some of the best infrared heating pads. We take a look at their features, benefits, dangers, and some FAQs. Read on and discover the best infrared heating pads for back and neck pain. FULL BODY VERSATILITY: perfect for treating sore muscles in your back, shoulder, abdomen, legs, arms, etc. Heat therapy is a natural remedy that has been used by millions of people to treat certain pains and diseases. The latest version of heat therapy is the far infrared therapy or FIR. So, how does infrared heating treatment work? We know the sun provides lights. But, beyond what we can see scientists have discovered that the light has energy that helps living things to thrive and grow. This same solar energy is absorbed by some gemstones such as jade, tourmaline, and amethyst stones. These gemstones, when heated convert the energy into FIR rays. When the rays come into contact with your body, using products such as infrared heating mats and pads, your body absorbs the energy and heals itself naturally. As far infrared therapy gains popularity, more and more company are creating infrared heating pads and mats. The good news is, the prices will be more affordable. The bad news, it’s going to be a challenge picking out the best. But, don’t worry. We got your back. In the review below we take an in-depth look into some of the best infrared heating pads on the market. Read on and discover which FIR heating pad meets your needs best. Today, there are various far infrared products on the market. In the article below we take a look at the best far infrared products for back, neck, shoulder, eyes, knees and more. Heat settings: 103°F-159°F, allows 1˚F increments. This UTK Jade heating Pad is one of the most sought-after FIR heating pad on the market. Its flexibility allows you to sit, lie or wrap it around the area that needs treatment. This FDA certified product uses natural jade stones. Jade stones allow for deeper penetration and higher temperatures, which in turn alleviates pain faster and enables your body to heal. This UTK heating pad comes with a smart digital controller that allows you to adjust the heat easily. The controller registers your favorite settings. You can use the UTK jade far infrared heating pad on your back, knees, hip, waist, or feet. Its compact size allows you to carry it to work or even when going camping. It is important to note that UTK Far infrared heating pads are available in different sizes; large, medium, and small. √ Its Velcro straps help keep it in place when in use. × Some users found it to be a bit heavy. When using this FIR heating pad, most users felt some difference within 30 minutes. However, if the tissue damage is too deep, the healing may take longer. Users love that it comes from a trusted brand. 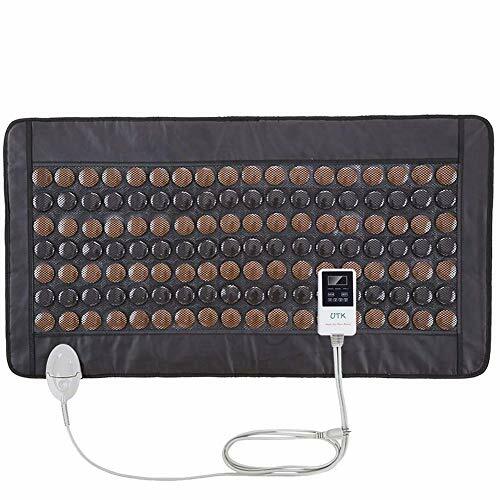 This UTK infrared heating pad is worth every penny you will spend on it. This is another excellent product by UTK that uses tourmaline gemstones. The gemstones emit negative ions and far infrared rays. The negative ions help the blood to regenerate faster and also provides more oxygen to the brain. This, in turn, helps the mind and body detoxify. 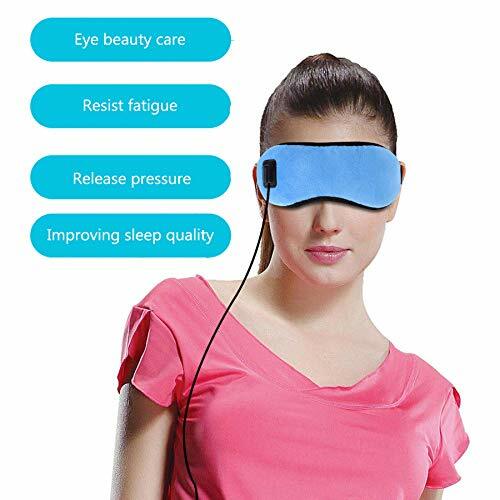 Just like other UTK heating pads, this far infrared tourmaline heating pad comes with a smart controller. This feature enables you to set the timer and temperature settings and save your favorite settings. The intelligent controller also allows the pad to shut-off automatically when not in use. The UTK tourmaline heating pad is perfect for shoulder and neck pain, sore muscles, and back pain. This unit can be used by both young people and the elderly. This product is FDA certified, RoHS-compliant, and FCC approved. For thousands of years, healers have successfully used tourmaline to treat their patients. Users favor this product because it is from UTK and it can cover the whole back perfectly. For best results, use your natural tourmaline heating pad for up to 30 minutes. 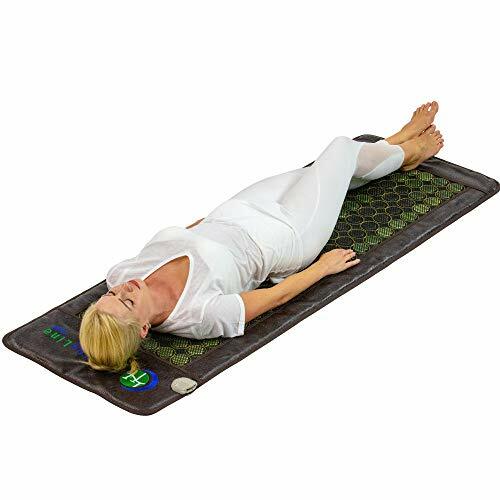 Using far infrared technology, this heating mat works by enabling the energy to penetrate deep into the body tissue. Once the energy reaches the tissue, blood starts circulating efficiently, reducing inflammation and activating healing. This jade heating pad utilizes healing energy radiated from natural jade stones. You can use this Back Rescue unit if you have arthritis, fibromyalgia, insomnia, and joint and back pain. The manufacturer says that most users have seen remarkable results within 30 minutes. However, if you suffer from conditions such as arthritis or lower back pain, it may take longer to see results, probably after three days. √ Covers the whole back perfectly. 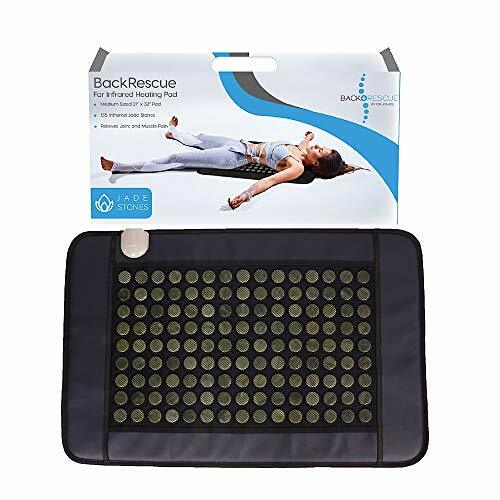 This Back Rescue far infrared heating pad has an average of 4.5 rating. Most users commented that the pad is well made and they were able to drape it over their backs easily. If you don’t have an infrared heating pad, try this unit. If you are looking for an affordable heating pad, then consider the SeHeat heating pad. 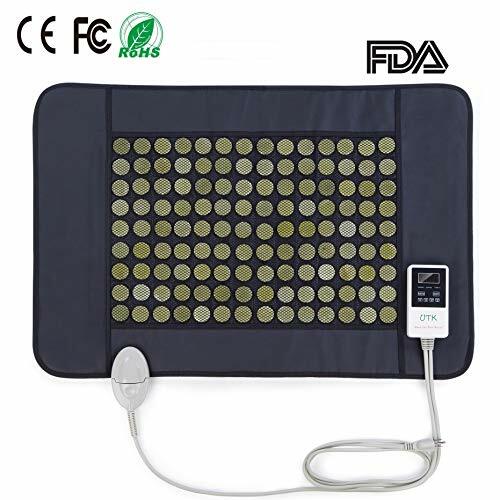 This jade heating pad is one of the best home treatment devices for neck and back pain. Its gemstones convert the heat into infrared rays which the body quickly absorbs. Using this heating pad, the rays will penetrate your body up to 8 inches deep. You can use this mat to treat symptoms of arthritis, back pain, muscle spasms, and joint pain. Each pad comes with a smart digital controller that helps with temperature settings and auto shut-off. × Some users found the cord to be a bit bulky. The SeHeat far infrared heating pad has an average rating of 4.2. Though this pad is not FDA approved, users still use it because they trust the brand. This heating pad will elevate your pain and help you get some restful sleep. As you age, your body is susceptible to sore muscles, sore joints and arthritis. The HY HealthLine heating pad combines both jade stones and tourmaline stones to emit negative ions that penetrate deep into the body, allowing the body tissues to self-heal. It is made of 21 layers and using its controller; you can set the temperature up to 160˚F/70˚ Celsius. The manufacturer has included a protective layer on each mat, so you are assured of protection from electromagnetic fields. You can use this mat for shiatsu, meditation, exercise, reflexology, Swedish massage and yoga. This is another excellent far infrared heating pad. Users have found it to be more effective than steroid shots or regular electric heating pads. The HY HealthLine works as it should. Now, all the far infrared heating pads we have reviewed above use either jade stones or tourmaline. Each stone has its benefit. But, there is one exceptional UTK heating pad that gives you the advantage of both stones for faster and better results. 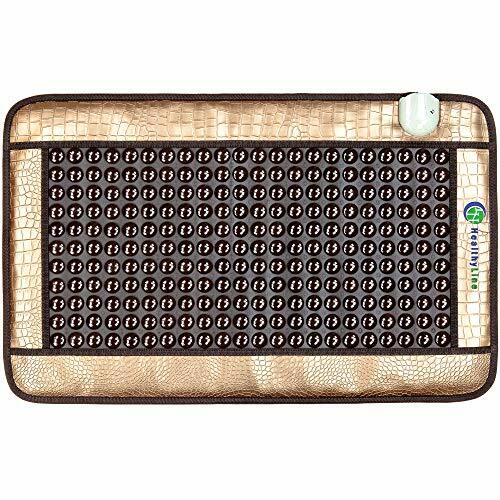 Just like all UTK far infrared heating pad, this versatile pad incorporates several layers; 1 mesh layer, 1 plush leather layer, 1 temperature sensor layer, 1 jade stones and tourmaline layer, 1 carbon fiber woven layer, 1 non-ferrous metal layer, 1 thermal protection layer, and 3 layers of cotton. This unit comes with a long 10-foot power cable and will auto shut-off after 240 minutes. This product is listed as a medical device class II. Well, this is another awesome product from UTK. The beauty of it, is you get the benefits of both tourmaline and jade stones. If you are suffering from chronic pain, try this excellent product. Now, if your pain is localized around the neck, you need a far infrared heating pad explicitly designed to fit perfectly around the neck. The advantage with neck infrared heating pads is that they are compact, so you can carry your pad and use it on a plane while driving, or at work. Here are the best infrared heating pads for neck. This jade heating pad works way better than conventional heating pads. It has a more robust construction and a sleek design. The UTK neck heating pad comes with a long cable, controller, and connections. It is compatible with ac 220 – 240 V and ac 110-120 V and offers heat up to 159˚F. This neck heating pad is foldable, allowing you to wrap it around your shoulders. The Velcro straps hold the pad in place. So, how does it work? When you plug your pad, it heats the jade stones. The far infrared rays from the jade stones penetrate the body, relieving pain. The negative ions cause a biochemical reaction that helps reduce stress, improve your immune system, and boost energy. This unit comes with a travel bag so you can carry it easily and protect it from wear and tear. The neck, shoulder, and back often bear the negative effects of gravity. If you are traveling, you need a versatile infrared heating pad that you can use on the plane and easily store it away when not in use. 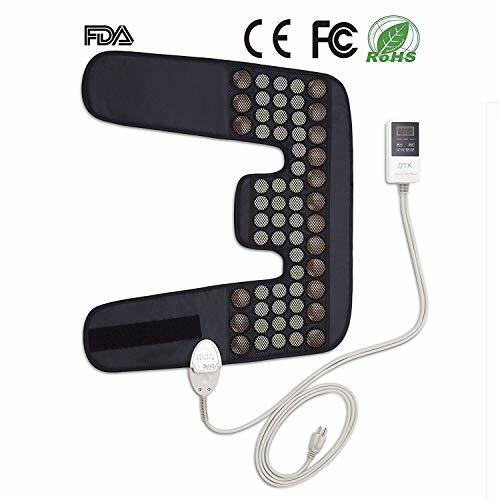 The UTK far infrared heating pad for neck will meet all these requirements. The Miric heating pad is way smaller than the UTK neck infrared heating pad. It is made of graphene. This material is thinner than PU leather, allowing the unit to heat steadily and evenly. The heat generated measures 6-14 μm. The manufacturer says that this unit takes only 3 seconds to warm up and 10 seconds to heat up. With this Miric heat pad, you get three temperature settings; 100˚F (38˚C), 104˚F (40˚C), 113˚F (43˚C). 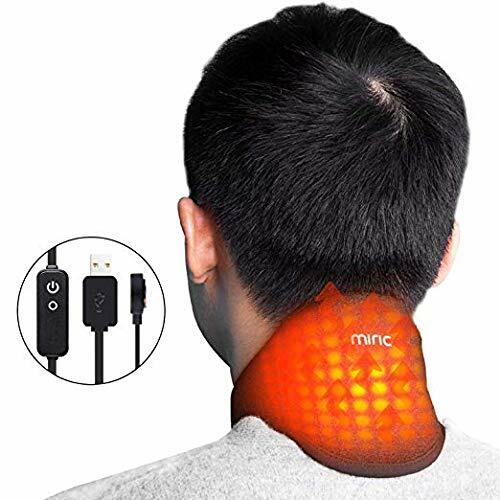 Using the Miric heating pad, you will say goodbye to that persistent neck pain. √ Charges fast via the USB port. While it is true that the Miric heating pad has to stay plugged when you are using, you can always use a small portable power bank to charge it. This product is small enough to fit on any neck. With it, you are assured of neck pain relief even when traveling. Common! Another UTK product? YES! There are several UTK far infrared products on our far infrared heating pad review. I so love their products, and most people do. See, UTK has specialized in creating far infrared devices. So, you can be assured this shoulder, and neck pad packs some awesome features and benefits. Just like the other UTK neck heating pad this jade heating pad is sturdy, flexible, and comes with a digital controller. It is compatible with AC 110-120 V. The only difference between the two neck units is the design. There are many causes of knee pain. Despite the cause, knee pain feels the same. It hurts like crazy. It’s been proven, scientifically, that infrared therapy helps reduce knee pain fast. Thermedic PW heating pad is a versatile medical tool that you can use to treat knee pain. 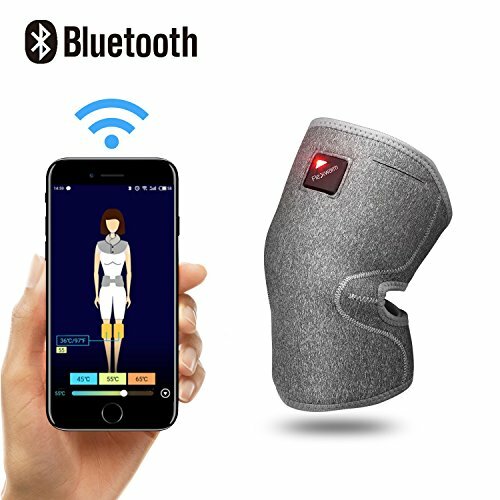 The best part is, you can also use your Thermedic far infrared heating pad on your elbow, ankle, forearm, thigh, foot and calf. The manufacturer has made the unit from carbon fabric. This fabric enhances conductivity and durability. Thermedic PW has three temperature settings and to ensure the safety of users; it automatically shuts off after 30 minutes of use. The product measures 7.5 x 6.3 x 3.6 inches and weighs 15.5 ounces. 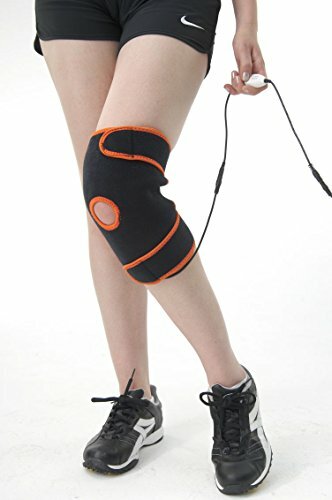 The Thermotex TTS is another excellent unit you can use to get rid of knee pain. What makes it one of the best heating pads is that you can use it over bandage or casts. This heating pad is highly portable and easy to operate. You can use it at home, in a clinic, in the car, or at work. After 20 minutes of use, the infrared rays from Thermotex will have already penetrated up to 6 inches deep, promoting healing and accelerating rehabilitation. This product weighs 2 pounds. × Does not have heat settings. If your job requires you stand, kneel, walk or bend a lot, you need to protect your knees. One of the ways you can protect your knee is through the Flexwarm. This heating pad is discreet, and your knee won’t feel suffocated. The Flexwarm far infrared heating pad has 3 temperature settings. The first setting (blue light) allows you to set up temperature up to 45℃/113℉. The second setting (yellow light) will enable you to set up temperature up to 55℃/131℉. The third setting (red light) will enable you to set up temperature up to 65℃/149℉. The FLexwarm heating pad also comes with an app. This app allows you to connect your tablet or smartphone via Bluetooth, enabling you to control the heating pad’s temperature settings easily. Another reason why you should get the Flexwarm heating pad is that it comes with a power bank and USB cable. This product weighs 1.5 pounds. √ Heat lasts for 5-7 hours when fully charged. Every so often, our eyes suffer from pain that is as a result of allergies, sinuses infection, or foreign objects. Far infrared therapy or red light therapy eye protection is the use of infrared devices to help alleviate the pain and promote healing. To help relieve fatigue, reduce inflammation, or improve blood circulation in your eyes, you need a versatile heating pad. 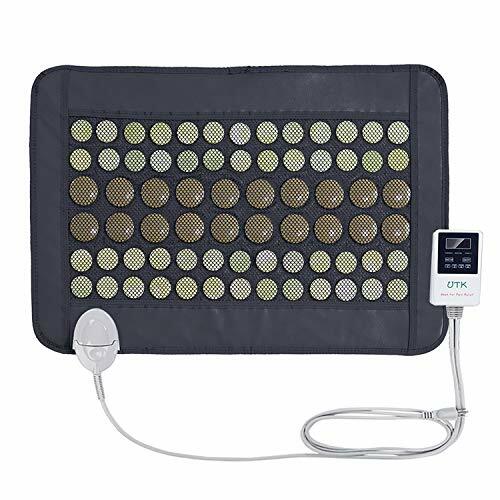 This far infrared heating pad is designed to stimulate blood circulation and reduce inflammation. It comes with a USB charging design that allows you to charge it using any 5V power bank, smartphone charger, or car charger. It comes with an on/off switch, 3 temperature settings; Green- low heat (95°F) Blue- medium heat (113°F), Red- High heat ( 125.6°F). Be sure to read your user’s manual carefully before using this tool. The manufacturer recommends you use a Samsung or Apple charger. This is the best SPA for tired and aching eyes. Did you know that far infrared therapy can help eliminate dark circles and freckles around your eyes? Well, this product is designed to do that and more. It is made of elastic material, meaning it will adjust to your head size correctly. So, how safe is this product? Eyes are sensitive, and a lousy product could make a bad situation worse. For safety, the manufacturer has included an automatic shut-off function. This heating pad is set to turn off after one hour of use. This heating mask uses graphene as its heating element. Graphene provides the same far infrared wavelength as the human body and offers even surface heating. Use the switch button to control its temperature settings. The temperature modes range from low to high (100.4°F to 113°F). This product measures 10.7 x 3.3 x 0.4 inches and weighs 1.76 ounces. The Logas far infrared heating pad also uses graphene as its heating element. Graphene is one strongest and thinnest heating film material. The exterior is made of SRC material. This material is soft and comfortable, ensuring the product conforms perfectly to the eyes outline and does not leave marks. You can use a laptop or power bank to recharge your Logas heating pad. This product is perfect for women, children and men. It measures 690 x 86mm. You can use your heating pad while on the train or plane or during lunch break. If you are looking for a far infrared product that can cover the whole body in one therapy session, consider far infrared heating mats. These products are larger than far infrared heating pads and will cover you for your head to the tip of the toes. Materials: 1lbs natural jade stones, 1lbs tourmaline ceramic stones, 12lbs amethyst gemstones. This HL Healthyline measures a whopping 72 X 24 inches. This makes it large enough to cover your entire body. 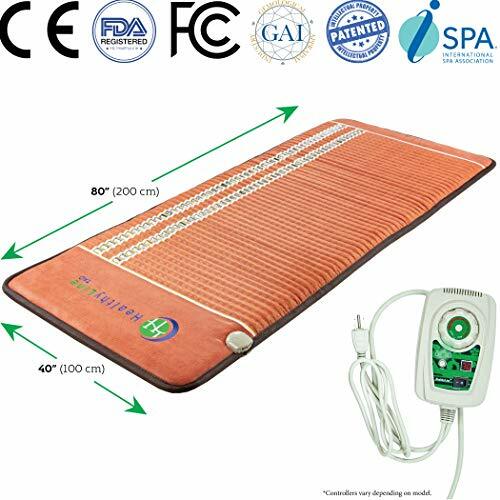 HL Healthyline heating mat is FDA certified. The top layer is made of soft material, allowing you to lay on it comfortably. For the production of far infrared rays, the manufacturer has included natural jade stones, ceramic gemstones, and natural amethyst gemstones. For safety reasons, the manufacturer has added an auto shutoff feature to this mat. You can use your HL HealthyLine mat to decrease cancer symptoms, increase joint flexibility, reduce blood pressure levels, and more. This is one of the best far infrared heating mats for bed, couch, recliner or adjustable bed. 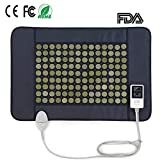 Another great far infrared heating mat is the MediCrystal mat. This mat features 18 layers of natural purple amethyst crystals. These crystals are untreated and unpainted, so you are guaranteed they are 100% pure. When the stones heat, they release far infrared heat and negative ions, which promotes healing.The MediCrystal mat comes with overheat protection and is fitted with an EMF-free heating system. It also comes with a digital controller that sets and maintains the temperature between 30°-70°C (86°-158°F). The FIR heating area measures 59 x 24 inches. 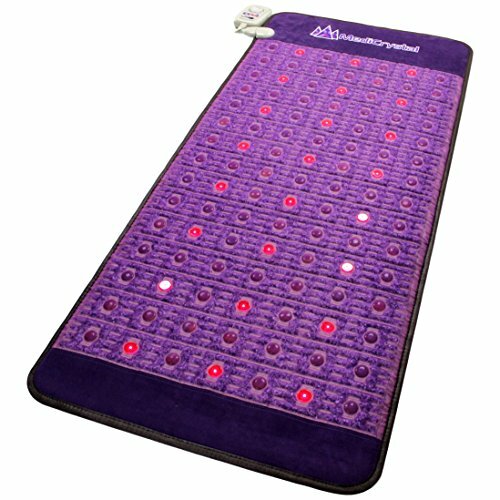 The Ereada Amethyst heating mat is designed by Hyundai Medical factory, a company that has specialized in the manufacturing of hot stones mat. They have been in operation for the last 20 years. The mat is packed with 15 layers of natural amethyst crystals that emit FIR rays and negative ions. 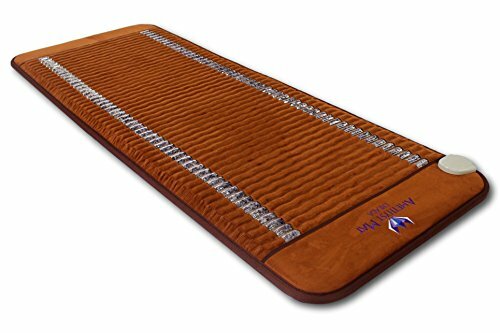 The Ereada heating Mat measures 59 x 24 inches. This is enough to cover your entire back. You can set the temperature between 86-158F. Now, if you are taller than the average person or require a mat that can fit a queen sized bed, go for the HL HealthyLine 4-in-1 infrared heating mat. It is one of the largest heating mats on the market. It is designed to help with arteriovenous fistula, inhibit the growth of cancer cells, stimulate weight loss, and detoxify your body. You can use it on the floor, massage table, or even in bed. This FIR mat uses obsidian gemstones, crushed tourmaline gemstones, and natural amethyst gemstones to produces FIR rays and negative ions. The manufacturer has added extra EMF-blocking layers. The Charmed mini heating mat is another excellent heating mat designed to help you detoxify your body and relieve pain and stress. It is made of 16 layers of natural Amethyst and Tourmaline stones. The mat also features an EMF-free heating system. 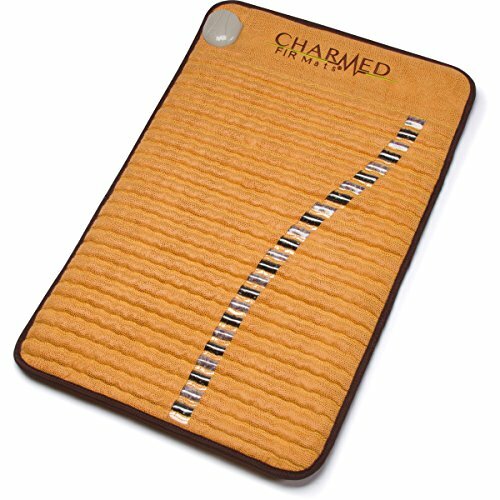 The Charmed FIR mat is FDA registered. This far infrared minimat comes a waterproof carrying case and a manual timer controller. The temperature reaches up to 158 degrees. Now this one is my favorite. Don’t get me wrong; there is nothing wrong with drugs. However, some may have some not so good side effects. Now, most people are determined to live healthier drug-free lives. FIR pads and mats use jade stones, amethyst and/or tourmaline. These stones heat up and transmit the infrared energy to the targeted spot. This helps your body to heal fast and naturally. The heat from this product helps enhance blood circulation, especially on people susceptible to coronary risk factors. The increase in blood circulation helps your body to get rid of toxins, smoothen and clear the skin and helps balance lymph and thyroid glands. A recent study showed that as the blood circulates faster due to the heat, the body starts to burn calories. After lying on your infrared heating mat for 30 minutes, you are likely to lose as much weight as someone who went for a jog for 20 minutes. How cool is that! When most people want to recharge, they always have a coffee. However, this drink may harm your health in the long run. If you’re going to recharge your body, just use your heating pad for a few minutes. The heat generated supercharges your body by increasing the level of negative ions in your blood. This, in turn, increases cellular metabolism that gives you that energy boost you need. 1.What are far infrared rays? FIR are wavelengths that are produced after gemstones such as amethyst, tourmaline and jade stones are heated. These rays then penetrate the body and stimulate blood circulation, causing your body to heal itself. 2. Do infrared heating pads work? Yes, they do, and thousands of users have testified to this effect. FIR heating pads work better compared to the standard heating pads or infrared lamps. The rays for infrared heating pads penetrate up to 6 inches deep, enabling your body to heal faster. 3. Are heating pads safe? Yes FIR pads are safe to use. All the stones used are 100% pure and safe. However, as you start using your heating pad, it’s recommended you start with smaller sessions. Use the heating pad or mat for 5-10 minutes. As your body gets used to the heat, you can adjust the minutes according to your needs. If you want to use your heating mat overnight, make sure to set it at low temperatures. There are no known adverse effects of using infrared heat therapy. However, make sure to follow the directions in the user manual. Pain! The thing we dread but our bodies are susceptible to. If you suffer from pain, you have some options. You can use steroids shots, try some at home back exercises, visit a chiropractor or just get an infrared heating pad/mat. You may be deterred by the price, but your health is important, so invest in it. In this review, we cover some of the best far infrared heating pads/mats. 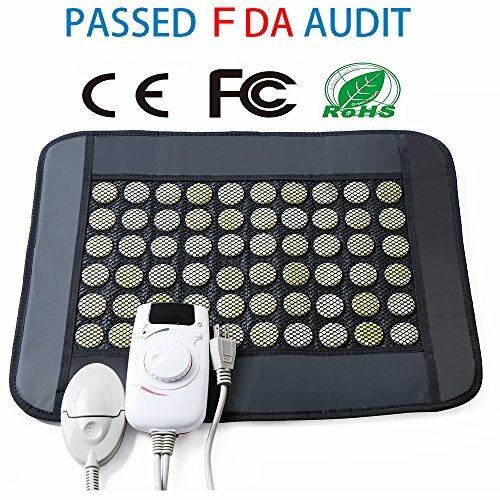 We believe you will find the right pad on this far infrared heating pad review.